I was quite amazed this mural has not been mentioned in other blogs on Deptford. Its tucked away at the back of the shops on the edge of the public parking bay halfway up Deptford High Street. It is a stunning piece depicting the "Royal George at the launch of another ship of the line "The Cambridge" not shown in this part of the mural. 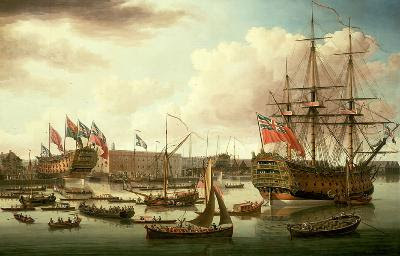 It was painted by John Cleveley the Elder who was famous for his maritime scenes. Can anyone tell me why and who commisioned it to be placed here? Theres something very spooky going on here when this picture was taken and appeared on the Lewisham Councils website. The mural is in reverse! I took the recent photo above three weeks ago and its the right way around as per the original painting. Somebody must have spotted the fo-par and turned it around the right way!!! Thanks to the Deptford Dame and The Shipwrights Palace for drawing my attention to it......no pun intended. amusingly the painting is reproduced the wrong way around. Hurrah to however managed to create such a nowhere place, erect a sign to tell us we are in 'Deptford Town Centre' and paste up a great example of British maritime art the wrong way around. I have to agree my friend what a nowhere place...How do you mean the is the wrong way around as the painting above is I thought the original..or is it??? I wrote about the mural on my blog back in December, and also noted that it had been reversed. The pictures I took a couple of weeks ago shows the correct position of the ship. I checked your link with the frankham street project and it does show by there photos a reversed picture...did they realise and change it??? All is light.....The picture wich I posted above the photo is displayed on the original website back to front thus giving the impression to me that it the right way round..oops! It gets even lighter. The pictures which are shown on the Lewisham website concerning the mural must be computer generated to allow the local residents a chance to vote for which mural they would like, hence different murals but the same make of vehicle (Ford Ka) inserted. It seems that when you access their site its pot luck as to which mural is displayed. I should have investigated deeper. ugh! I have to ask...has anyone reported this to Lewisham Council..?? I would have thought someone has. If they have and nothings been done its shameful.